3.1919: Launched by A. Hall & Co Ltd, Aberdeen (Yd.No.566) (“Admiralty drifter”) for The Admiralty as GALE (Ad.No.4125). 5.1919: Sold to W. J. E. Green Ltd, Great Yarmouth (William J. E. Green, manager). 6.6.1919: Completed as OCEAN LOVER. 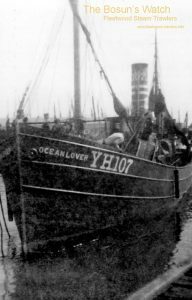 7.6.1919: Registered at Yarmouth (YH107). 30.10.1925: Landed at IJmuiden 125 crans grossed £285. 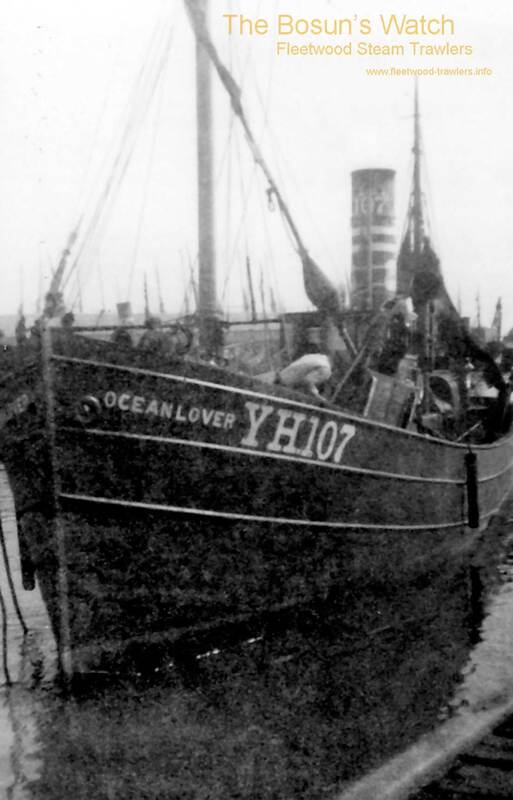 13.1.1926: Landed 5 tons of white fish at Yarmouth having been delayed two days by fog. 1930s: Seasonal fishing from Fleetwood (Alex Keay, Fleetwood/Lowestoft Fish Selling Co Ltd, Lowestoft, managing agent) (Notable skipper, Arthur Cobb, Lowestoft). 17.3.1940: Requisitioned for war service under Naval control (Hire rate £32.0.0d/month). Based Southend. 9.1.1946: Sold to Arthur P. Buchan (22/64), Peter Buchan (21/64) & John F. Buchan (21/64), Peterhead. 3.1945: Registered at Peterhead (PD157). 6.1950: Off Rattray Head (Sk. Arthur Buchan) in thick fog, foundered after being in collision with steam trawler CUNNINGHAM (GY86). Nine crew picked up but Sk. Buchan who was taking this trip as a relief for his son Peter Buchan, was lost. Survivors landed at Peterhead. 14/06/2011: Page published. 5 updates since then. 24/12/2018: Removed FMHT watermarks from images. This entry was posted in Drifter/Trawler, Lost Vessels, Seasonal Visitors, Steam Trawlers and tagged Admiralty Drifter, Lost, Seasonal Visitors on June 14, 2011 by Fred Smith. 1920: Launched by Routh & Waddingham, Winteringham (Yd.No.- ) (“Admiralty drifter”) for The Admiralty as SWELL (Ad.No.4186). 23.6.1920: Completed as a fishing vessel. 14.12.1920: Transferred to The Fishery Board for Scotland, Edinburgh for disposal. Laid up at Dundee. 3.8.1922: Sold to Grimsby Seine Fishing Co Ltd (64/64), Grimsby. 3.8.1922: Samuel Franklin appointed manager. Converted for seine netting. 1.8.1922: Registered at Grimsby as SILVERNIGHT (GY138). 16.9.1922: Vessel mortgaged (64/64) to Lloyds Bank Ltd, London (A). 18.4.1932: Mortgage (A) transferred to Samuel Franklin (64/64), Grimsby. 3.6.1932: Sold under mortgage (A) to Harry Franklin Ltd (64/64), Grimsby. 7.6.1932: Harry Norman Franklin appointed manager. 14.6.1932: Vessel mortgaged (64/64) to Barclays Bank Ltd, London (B). 14.7.1932: Shares (21/64) sold to Sk. Robert Cowie, Cleethorpes. 14.7.1932: Robert Cowie shares (21/64) mortgaged to Harry Franklin Ltd, Grimsby (C). 14.7.1932: Harry Norman Franklin appointed manager. 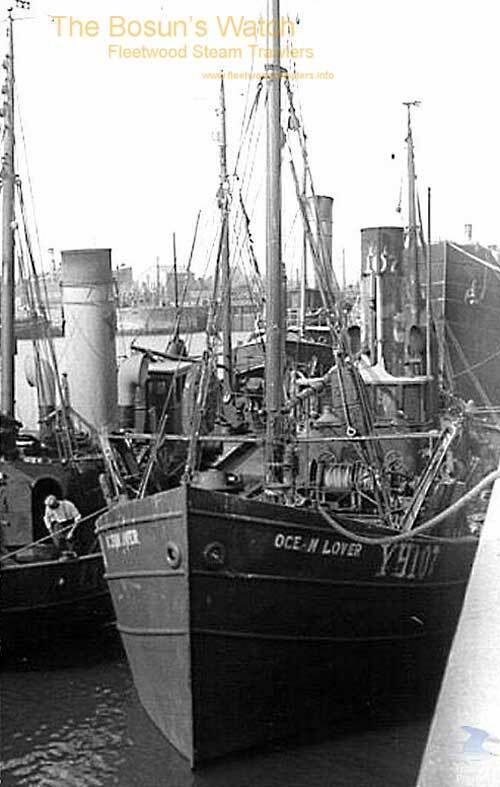 1.1.1948: Robert Cowie shares (21/64) sold to Harry Franklin Ltd (64/64), Grimsby. 1.1.1948: Harry Norman Franklin appointed manager. 1955: Sold for breaking up. 21.10.1955: Grimsby registry closed. “Vessel broken up”. 07/04/2011: Page published. 5 updates since then. 21/11/2018: Removed FMHT watermark from image. This entry was posted in Steam Trawlers, Steamers (Picture), Wartime Visitors and tagged Admiralty Drifter, No Fleetwood owners on April 7, 2011 by Fred Smith. 14.2.1920: Launched by Clapson & Sons, Barton on Humber (Yd.No.18) (“Admiralty drifter”) for The Admiralty as FOUNTAIN (Ad.No.4161). 3.6.1920: Completed as a fishing vessel. 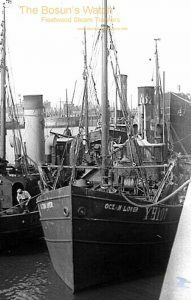 3.2.1922: Sold to Grimsby Seine Fishing Co Ltd (64/64), Grimsby. Converted for seine netting. 19.7.1922: Registered at Grimsby as WHITENIGHT (GY88). 19.7.1922: Samuel Franklin appointed manager. 25.7.1922: Vessel mortgaged (64/64) to Loyds Bank Ltd, London (A). 21.12.1931: Sold to Harry Norman Franklin (64/64), Grimsby. 21.12.1931: Harry Norman Franklin appointed manager. 14.1.1932: Shares (43/64) sold to Harry Franklin Ltd (43/64), Grimsby. 14.1.1932: Shares (21/64) sold to Sk. Andrew Wilson Mair (21/64), Cleethorpes. 14.1.1932: Harry Norman Franklin appointed manager. 23.3.1932: Vessel mortgaged (43/64) to Barclays Bank Ltd, London (B). 24.5.1932: Andrew Wilson Mair shares (21/64) mortgaged to Harry Franklin Ltd (21/64), Grimsby (C). 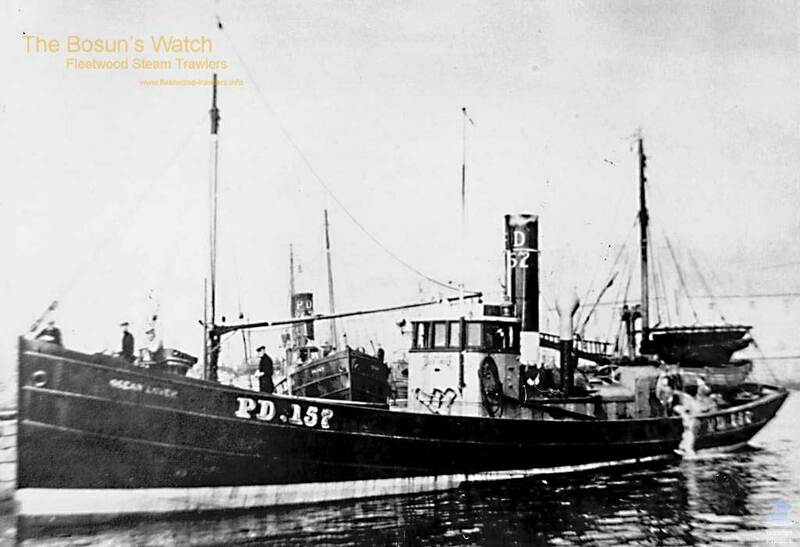 1.3.1934: Andrew Wilson Mair shares (21/64) sold to Harry Franklin Ltd (64/64), Grimsby. 2.3.1934: Harry Norman Franklin appointed manager. 1949: Converted to a floating club house for Grimsby & Cleethorpes Yacht Club. Moored in Alexandra Dock, Grimsby. 19.10.1954: Grimsby registry closed. “Vessel broken up” (although reported by beneficial owner, this was not the case). 1974: In poor condition buried by contractors in the building of the Grimsby car import terminal at Winnipeg (now Westgate). 07/04/2011: Page published. 6 updates since then. 21/11/2018: Removed FMHT watermark from images. 1918: Launched by A. Hall & Co Ltd, Aberdeen (Yd.No.544) (“Admiralty drifter”) for The Admiralty as SANDSTORM (Ad.No.3907). 12.7.1920: Transferred to The Fishery Board for Scotland, Edinburgh for disposal. 10.1920: Sold to Thomas Gilmour, Aberdeen (John H. Harrow, manager). 4.11.1920: Registered at Aberdeen as GLENBRECK (A381). 9.1923: Repossessed by The Admiralty. 3.9.1923: Aberdeen registry closed “Sold to Admiralty”. 10.1923: Sold to Thomas Thorburn Irvin, Aberdeen (managing owner). 2.1924: Registered at Berwick as RIVER EYE (BK3). 1926: Registered at Berwick as OLDEN TIMES (BK3). 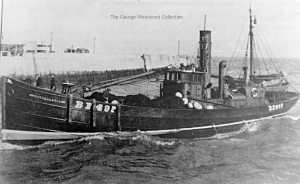 12.1929: Sold to George Hitcham Catchpole, Lowestoft. 20.12.1929: Registered at Lowestoft (LT127). 31.1.1930: Registered at Lowestoft as SEASONS’ GIFT (LT127). 14.2.1930: Sold to Stanley Edward Catchpole (32/64) & Ernest George Catchpole (32/64), Lowestoft (Stanley Edward Catchpole, manager). 4.2.1931: Sold to Stanley Edward Catchpole, Lowestoft. 7.7.1931: Sold to Sold to Frederick Ernest Beane (32/64), Lowestoft & Isaac Alexander Kemp (32/64), Kessingland (Frederick Ernest Beane, manager). 27.2.1939: Sold to Frederick Ernest Beane, Lowestoft. 26.7.1940: Requisitioned for war service on balloon barrage (Hire rate £32.0.0d/month). 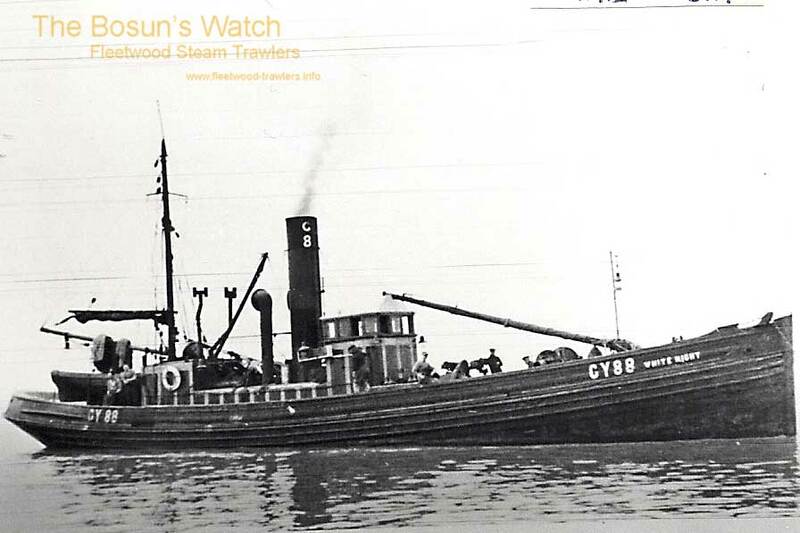 24.2.1941: In Wyre channel in collision with Icelandic wooden motor fishing vessel HELGI (115grt/1939). 3.1.1942: Frederick Ernest Beane died. 7.4.1943: Transferred to Mrs Margaret Beane, Lowestoft. 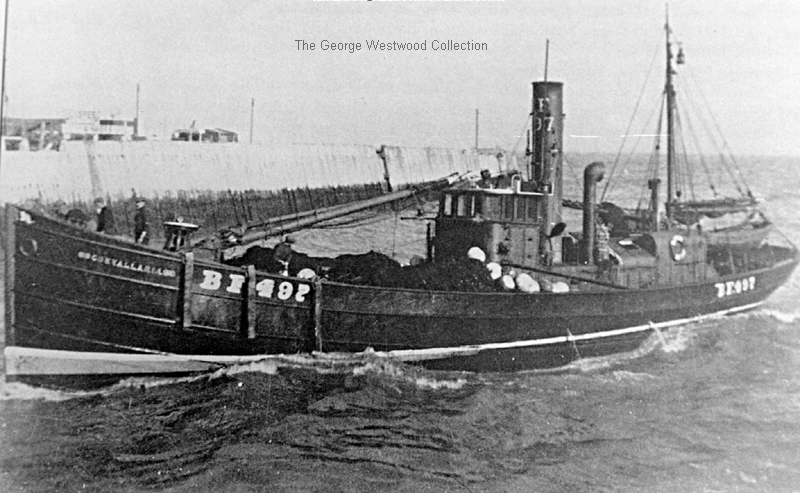 1946-1950: Seasonal trawling from Fleetwood. 1954: Sold to Belgian shipbreakers. 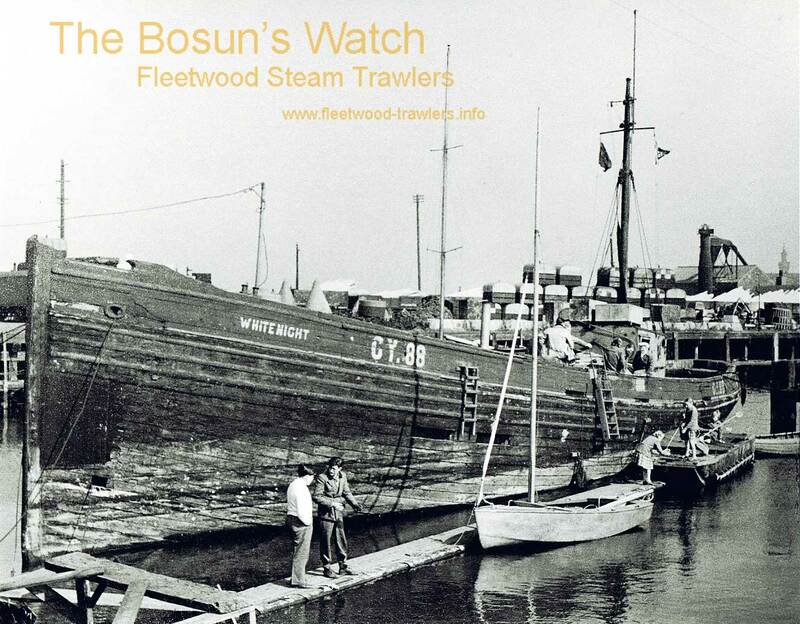 17.5.1954: Sailed Lowestoft for Antwerp. 21/02/2011: Page published. 2 updates since then. This entry was posted in Drifter/Trawler, Steam Trawlers, Wartime Visitors and tagged Admiralty Drifter, Drifter/Trawler, No Fleetwood owners, Seasonal, Wartime Visitor on February 21, 2011 by Fred Smith. 1919: Launched by A. Hall & Co Ltd, Aberdeen (Yd.No.568) ) (“Admiralty drifter”) for The Admiralty as WATERSHED (Ad.No.4127). 18.10.1919: Completed as a fishing vessel. 24.10.1919: Transferred to Ministry of Agriculture & Fisheries, London for disposal. 23.12.1919: Registered at Lowestoft on Part IV Register (LT628). 27.7.1921: Lowestoft registry closed By Order of Chief Registrar of Shipping. “To be registered under Part I in London”. 7.1921: Registered by The Admiralty in the Registry of British Ships at London (No.401 of1921). 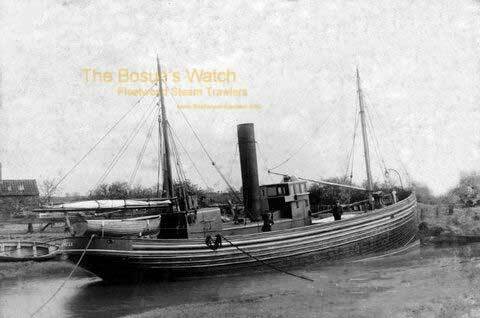 9.1921: Sold to Savoy Steam Fishing Co Ltd, Grimsby (H. Croft Baker, manager). 12.9.1921: Registered at Grimsby (GY1302). 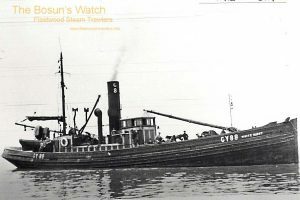 26.6.1922: Registered at Grimsby as SALVIAN (GY1302). 4.1923: Sold to Havre Pêcheries Co, Havre. 5.1923: Registered at Le Havre as SANVIE. 1924: Sold to James Ritchie, Gardenstown & others. Le Havre registry closed. Registered at Banff as CONVALLARIA (BF51). 27.11.1930: Sold to George Hitcham Catchpole, Lowestoft. 27.11.1930: Registered at Lowestoft (LT247). 9.7.1931: Sold to Stanley Edward Catchpole, Lowestoft. 1930s: Seasonal trawling from Fleetwood (Lowestoft Fish Selling Co Ltd, Lowestoft, managing agent). 30.3.1937: Re-possessed by mortgagee Peacock & Co (Lowestoft) Ltd, Lowestoft (Frederick Beane, manager). 12.8.1938: Sold to James Ritchie, Fraserburgh. 3.9.1938: Registered at Banff (BF497). 1939: Sold to Mrs Jane A. Ritchie, Fraserburgh & others. 10.4.1940: requisitioned for war service on harbour defence patrol (Hire rate £17.17.10d/month). 10.1943: Employed on miscellaneous Naval duties. 1946: Sold to Albert Sutton & A. R. Sutton, Scarborough. 26.3.1946: Returned to owners. Fishing from Lowestoft. 1954: Sold for breaking up. Banff registry closed. 28/01/2011: Page published. 6 updates since then. 08/11/2018: Removed FMHT watermark from image. This entry was posted in Drifter/Trawler, Seasonal Visitors, Steam Trawlers, Steamers (Picture) and tagged Admiralty Drifter, Drifter/Trawler, No Fleetwood owners, Seasonal on January 28, 2011 by Fred Smith.